face value "50·BANI", ·ROMANIA·1914·, at left a vegetable adornment, Romanian coat of arms, at lower right, near the rim, ESSAI outer pearl circle, inscription "CAROL·1·REGE· AL·ROMANIEI·" meaning "CAROL 1 KING OF ROMANIA", the head of the king facing left. Under the neck lies CH.P. standing for the name of the engraver, Charles Pillet. 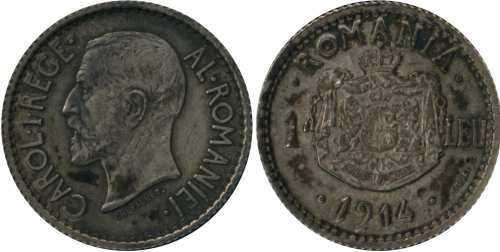 Romanian coat of arms, face value "1 LEU", ·ROMANIA·, year ·1914·, at lower right, near the rim, ESSAI outer pearl circle, inscription "CAROL·1·REGE· AL·ROMANIEI·" meaning "CAROL 1 KING OF ROMANIA", the head of the king facing left. Under the neck lies CH.PILLET. standing for the name of the engraver, Charles Pillet. 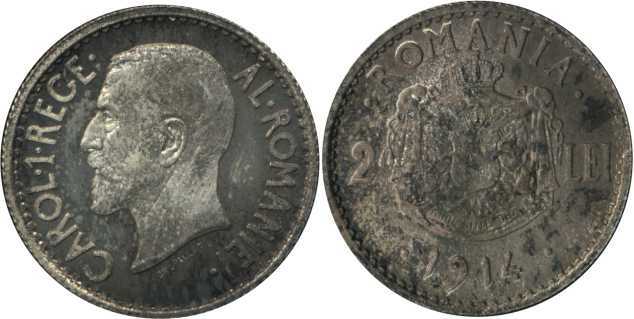 Romanian coat of arms, face value "2 LEI", ·ROMANIA·, year ·1914·, at lower right, near the rim, ESSAI outer pearl circle, inscription "CAROL·1·REGE· AL·ROMANIEI·" meaning "CAROL 1 KING OF ROMANIA", the head of the king facing left. Under the neck lies CH.PILLET. standing for the name of the engraver, Charles Pillet. The patterns pictures above are present on Romanian coins through the kind permission of Mr. J. Ardelean..
Romanian numismatics knows lots of monetary patterns, many of them being presented inside monograph Monede şi bancnote româneşti by George Buzdugan, Octavian Luchian and Constantin Oprescu (1977). These pieces appear at positions 218a, 218 and 219. 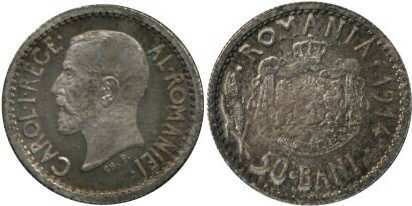 The patterns pictures below are present on Romanian coins through the kind permission of Mr. J. M.. The patterns are in pristine condition and were in the collection of the engraver.